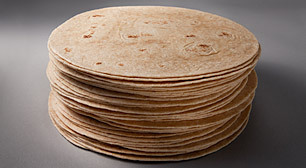 Give your menu a healthy boost with our 100% whole wheat tortillas. Our 10” tortillas are ideal for entrees such as chimichangas, quesadillas and burritos supreme. Master Case Net Weight 21.60 lb. Master Case Gross Weight 22.65 lb. Whole Wheat Flour, Water, Vegetable Shortening (Interesterified Soybean Oil, Fully Hydrogenated Soybean Oil), Contains 2% or less of the Following: Sugar, Salt, Leavening (Sodium Bicarbonate, Corn Starch, Sodium Aluminum Sulfate, Calcium Sulfate, Monocalcium Phosphate), Vital Wheat Gluten, Mono- and Diglycerides, Preservatives (Potassium Sorbate, Calcium Propionate), Fumaric Acid, Dough Conditioner (Sodium Metabisulfite). Contains Wheat.